The Synod of Catholic Bishops on the topic "Vocation and mission of the family in the Church and the contemporary world" came to an end. 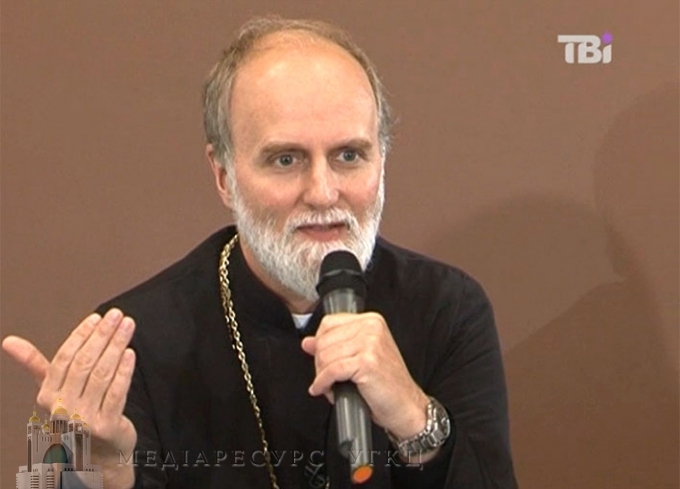 Bishop Borys (Gudziak), UCU President, Bishop of the Paris Eparchy of Volodymyr the Great for Ukrainians of the Byzantine Rite in France, the Benalux countries and Switzerland told more about course, main issues of the Synod, and perspectives of implementing its resolutions. Most Reverend Bishop, as a beginning, please tell us what is the Church organ of the Synod of Bishops; what is its structure and basic tasks? The history of the Synod of Bishops began after the Second Vatican Council, which was convened at the beginning of the sixties of the last century by Pope John XXIII. Actually in 1965 at the opening of the last session of that Council, already the next Pope Paul VI announced his decision about the creation of the Synod of Bishops. Thus, this year we are celebrating the 50th anniversary of the Synod of Bishops. The word "synod" in Greek means "to walk together", and thus the main characteristic of this institution is a community, collective leadership. Thereby the Synod is a place of meeting of bishops, headed by the Roman Pope, during which they exchange information and experience in order to together seek the pastoral decisions regarding significant issues which concern the life of the Church and the world, such as, for example: priesthood, bishop hood, marriage. There were also Synods which examined painful issues of Africa or the Near East. The topic of discussion at the Synod depends on the type of assembly, whether it is one that follows a previous one, or is an extraordinary one, or a special one. This year we had the 14th assembly of a regular Synod. From the beginning of its establishment, this is already the 27th meeting of the Synod of Catholic bishops, of which three were focused on discussing specifically the issue of the family. What role does the Synod of Bishops play for the Roman Pope? It is worthwhile to remember that, in contrast, for example, to our Church, the Synod of Bishops in Rome is a consultative one, and not a legislative organ. The document which is issued at the conclusion of a given Synod, can be perceived as a kind of advice for the Roman Pope on the basis of which the Holy Father can compose an Apostolic Epistle or an Encyclical. The significance of the Synod also lies in the fact that the participants are bishops from throughout the world who represent a variety of cultures and social contexts. This creates a particular opportunity, both for the Roman Pope as well as for all members of the Synod to feel the Universality of the Church, to better understand the issues which perturb people in various continents. This was the first time that you participated in the Synod. What were your impressions of it? For me these three weeks were both a school and spiritual exercises. The Synod was always accompanied by prayer, at which the Fathers of the Synod were present, Men of the Church with great spiritual experience. It was interesting to hear the thoughts of experts in theology and especially the presentation of married couples which numbered more than twenty at the Synod. Their presence and presentations were a gift for the Synod,-- to talk about a family without families, their voices, is probably not correct and also not very effective. Therefore, they were there not simply as listeners, but also as active advisors to the Fathers of the Synod. The overall number of participants reached around 345 people. Please tell us how the work of the Synod went. We worked pretty intensively. Meetings, plenary sessions started at 9 in the morning and finished at 7 in the evening, with a break for lunch. Besides that, there was an expectation of work in small language groups: four were English-speaking; three were Italian-speaking; three were French-speaking; two were Spanish-speaking; and one -- German-speaking. These were also the five official languages of the Synod. During the plenary sessions, everyone had the opportunity to appear in one of the noted languages over a three-minute period. Further discussions happened already in small groups. For example, our small English-speaking group numbered some 29 participants, of which 21 were bishops. Overall, we represented 20 countries -- all continents: Australia and New Zealand, Africa, Western and Eastern Europe, Southern and Northern America, also Asia, from Lebanon to India, Bangladesh, and the Philippines. Such a wok format permitted better immersion into the essence of the issues and, thereby, a clearer formation of appropriate pastoral decisions. With respect and prayer, with a feeling of theological subtelties, the Synod participants made quite a number of propositions for the final document. However, many participants noted that the working document was not edited well enough. At first, the Fathers and members of the Synod submitted 300 proposals through their plenary sessions. Then, we in small groups formulated some 1,200 proposals and corrections to the working document. Many of them were integrated into the text, which they presented to us on the Wednesday of the last week of the session. On Thursday, there appeared 250 more reactions to the already revised version. Again many proposals were included. On Saturday the Fathers of the Synod held a final vote on each one of the 94 paragraphs individually. Most positions were ratified by a great majority of the voters, in some cases, almost unanimously, and only several of them had a large number of negative votes. Around which issues was there the biggest discussion? The basic thematic point which was in the center of discussion at the Synod and which accordingly runs through the whole document -- is the search of an answer to the question of how the Church can assist contemporary families, considering all the challenges of today. How can the Church guide the family in its winding life pilgrimage. Overall, the Synod underlined the joy in the families and lovely examples of Christian family life. Good families are an example and teachers of family life. They testify that a Christian family is possible, even in difficult circumstances. Quite a few discussions concerned the issues of divorced or remarried couples, in terms of their place in the Church, thoughts about how to meet those who are through certain acts, are canonically limited, that is, they cannot receive Communion. Besides that, great attention was spent on the discussion of the economic and social situations of contemporary families in the whole world. The issues of violence and wars were also raised, from which today millions of people are suffering. The Synod paid attention to family violence, orphan hood, widowhood, the separate roles of a man, a woman, grandfathers, and grandmothers. Separately the Synod emphasized the issue of sainthood, prayers, Holy Scripture, reconciliation and forgiveness in the family. In the world media there was a clear feeling of a certain strain around this year's Synod, oriented towards the issue of the family. More often there were thoughts voiced that there are maturing revolutionary changes in the Catholic Church, for example as to the moral teachings about the family. Your commentary about such a position of the media. The press, in analyzing the work of the Synod often contrasted the issues of truth and mercy. Yet this contrast cannot exist. All priests of the Synod understand well that there is no mercy without truth and there is no truth without mercy. I want to emphasize that the individual topics which were raised in the media should not overshadow the hundreds of other significant aspects and challenges which concern family life today. For example, the problems of poverty, homelessness, emigration, wars, forced resettlement from one's home and one's country. Today there are close to three billion -- that is almost half of humanity, live on a budget of less than 2 dollars a day. A 100 million are homeless,150 million are orphans, 60 million are refugees, among whom there are many Ukrainians. These are all difficult realities, which directly influence the institute of the family today. Therefore much attention at the Synod was accorded to specifically discuss the economical and social fate of humankind. In fact, towards the end of the Synod, there was a document presented as to the war in Iraq, Syria, in the Near East, in Africa, and in Ukraine. What caused the expectation of changes in the moral teachings of the Church? I suspect that mainly through the fact that it involves a striking dissonance with contemporary radical individualism, which constantly is becoming more perhaps the only criterion for making life-important decisions. Today a person is driven by the philosophy: it is important that I realize myself, important that life suits ME, important that life be pleasing to ME. These are all important aspects of life but they are still marked by the poison of human egoism. It is not worthwhile to forget that our human life gains its fullness only in relations, in self-sacrifice, in God. Three people remain in a continuous dialogue. We are created in His image and likeness, in our spiritual DNK we have a need for interaction. Accordingly, the volitional, radical individualism which accents on separatism, the autonomy of individuals, depletes the connection with the other person whether in the family, or in the community, or in society, or in the country, or in the international context. It is a big threat to family life. Parents search for self-realization, leaving their children on the margins. A man cares about his satisfaction, forgetting about his wife, and vice versa. The abyss between generations increases constantly. Grandfathers and grandmothers in their senior years and in a feeble state are considered a burden, which can be gotten rid of as one-time dinnerware, an unplanned child -- is aborted. We stand in front of the challenge of preserving human dignity, which totally appears and develops in relations, in mutual connections. The Church in no way can follow similar compromises. We are called to preserve the God presented information, but also, certainly, should be open to the person standing before us, with her wounds and pains. We should not simply declare principles, but we need TO BE ALONGSIDE. Recently one of the Roman professors of Moral Theology, Bazilio Petra noted in his blog that the Synod lacked the perspectives of Eastern Theology in families and marriages. Do you agree with the Roman professor? It is difficult for me to totally agree with Professor Bazilio Petra, since at the Synod, besides the representatives of fifteen Eastern Catholic Churches, there were also delegates from the Orthodox Churches. As far as I know, in the small groups there was consideration of the Orthodox practices or particularities of theology. From our Church there were three delegates. And from 271 present bishops -- that is more than one percent although our Church consists of half a percent of all Catholics. If one considers that there were some 30 representatives of Eastern Churches in the conference hall, then that is almost 10 percent of the general number. Therefore, the Eastern Christians were very visible during this Synod. Perhaps some worthwhile issues were not covered during the Synod? There is no need to answer categorically. probably even in three weeks one cannot cover all the family issues, because the family is a large part of human life. The Synod really touched a great number of issues. First of all, it worked on the basis of a document which had been prepared over the year. Hence, a discussion of it lasted for three weeks, where everyone had a chance to have their say. There were almost 2,000 corrections and proposals submitted. Of course, it is impossible to somehow thoroughly present and analyze all topics. I think that for a long time we will still have to consider all that was presented, in order to adequately implement it into life. Overall, how do You see the practical implementation of the resolutions of the Synod into life by both the Catholic community as well as the UGCC in particular? I still do not have a complete strategy. For example, in Paris, in my eparchy in France, in the Benalux, and in Switzerland, at first I want to meet with my priests and laity in order to tell them, as I have just done for you, about the contents of the Synod, its importance for our Church and society in general. Then, I will encourage others to familiarize themselves with the Synod documents. We will try to think through how to present it on the parochial level. Since the document contains several hundreds of topics, we will in the beginning choose from it several priorities for our eparchy and the faithful in France, Switzerland, and the Benalux countries. Naturally, the process of implementing the Synod resolutions will be on-going. For this, we need years, maybe even decades. In your presentation at the Synod, you emphasized the particularities of the problems in families who bear the burden of the communist past. Specifically, you spoke about fear and the lack of trust, which prohibit the normal development of married life. Is it possible to rid oneself of this burden and how does one do it? From Albania and Estonia to China and Vietnam, there are 2 billion people who lived through communism or are descendants of those who were lesioned by this ideological radiation which influenced our spiritual chromosomes. As an example of our political life, wounded by corruption and other defects,we see that we are really very wounded by the totalitarian past -- we live in a broad post-traumatic jaw. This can only be cured by love, truthfulness, sincere relations, and orderliness. These are the ideas about which we talked during the Revolution of Dignity. Of course, it is not simple to implement them into life. I talked about this during the Synod since other countries and continents cannot totally realize what post-totalitarian heritage is. Perhaps, also we ourselves, cannot totally realize it and therefore still cannot be cured of it. However, we are working in that direction. I live with a great hope. I think that Ukraine is the epicenter of such healing processes. Today we have a great task regarding Russia, which is again sinking into authoritarianism, caused by a nostalgia for the totalitarian heritage. And this influences family life. The Soviet Union propagated the cult of Pavlyk Morozov, who betrayed his father to the party and each soviet child should follow his example. At home children were told: think one thing, say another, and do the third, because the system systematically destroys and you should not get engaged in the system. And social life, politics, and the family -- that is a system. If you are afraid to engage oneself in a system, to be trusting, to become sensitive in front of others, it is difficult for you to be a good family person or a citizen. Parallel to the Synod in Rome, right now in Ukraine there continue to be discussions as to omitting from the Constitution of Ukraine the definition of a marriage as a union between a man and a woman as well as the implementation of a new definition of "sexual orientation" as one of the beginning steps toward overcoming the classical understanding of a family. What would you suggest as an effective means of withstanding the mentioned challenges? I talked with president Petro Poroshenko and he assured me that he will not sign such a law. I think that this needs a lot of work. We all need to pray and to talk to our politicians. Here we do not need to go the route of pathos or shouting, but good, solid arguments so that the politicians become convinced in their steps to safeguard the family, and not to have them decide on the issue only because they are afraid of the opinion of the Church or their voters. Because, sooner or later, the fear will pass and then, if we build on fear, we will end up in a very dire situation. And in conclusion: your wishes for Ukrainian families. I advise all to read the conclusion remarks at the Synod of Pope Francis on Saturday, October 24th and his sermon on Sunday, October 25th. When I listened to it, I was deeply moved. The Universal Archierarch truly speaks God's words. He presents the Great God who calls us towards responsibility but who Himself is very merciful. It is specifically in mercy that God's face is best mnanifested . I think that after reading these words, we will feel the special blessing on us and our families.